We are now inviting clients to get on our spring estimate contact list. Be at the top of the list for your free estimate and consultation by filling out our Spring 2019 Estimate Request Form We will contact you in mid February -early March of 2019 to arrange for your landscaping estimate. An on-site walkthrough of your property. Introduction to our landscape designer if necessary. Discussion about various landscaping components that would work best for your property. Defining your borders is the key to great looking landscaping. There is nothing that helps you create a great looking landscape more than defining the borders of your garden beds and tree wells. You can use various border materials to define your borders such as stone mow pavers, Vinyl edging, aluminum edging, clean line edging, natural edging, raised or natural stone, concrete curbing. Define your borders with creative curves or straight lines depending on your preference. Not only do defined borders give you a great looking landscape but they also help with maintenance of your yard by helping to keep grass from growing into your garden beds or mulch or decorative stone spilling on to your lawn. If you are on a budget then you could choose to simply edge out a defined border around your tree wells or garden beds. This will need to be done one time per season at a minimum. A more permanent border like edging or mowing pavers will eliminate the need for hand edging giving you a lower maintenance landscape. 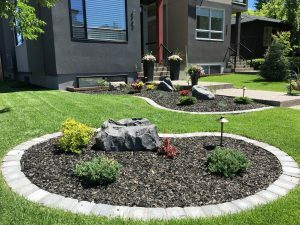 Fall is a great time for Landscaping in Calgary! Did you know that trees, shrubs and sod do much better when planted in the cooler fall months than they do when planted during our hot summers? Trees, shrubs and sod start to go dormant in fall and therefore they are far less likely to go into shock when they are planted. Summer is in the middle of their peak growing season so it is very hard on plantings and sod, especially with our hot, dry summers. The cooler fall weather combined with the plant dormancy cycle means you can don’t have to worry about planting trees or shrubs or laying sod. Chinook Landscaping and Design typically installs plantings, paving stones, retaining walls and all other landscape components right up to and beyond Halloween. 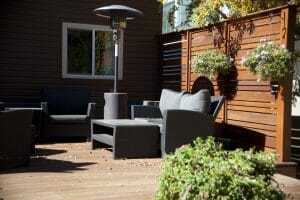 Visit our website at landscapingcalgary.org for more or Call us at 403-452-8552 for your no cost estimate. Artificial turf is becoming more and more popular in Calgary. Especially for homeowners who are with busy lifestyles who don’t want to worry about making sure their lawns get enough water. Artificial turf has come a long way in the past several years. 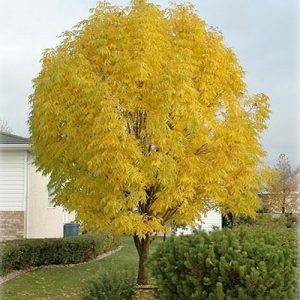 When it first came on the market it was available in limited styles and textures and most of the product on the market looked very fake or would look fake after a couple years of enduring our harsh Calgary winters. There has definitely been a huge improvement in artificial turf quality as well as options to choose from. You can find artificial turf in many different styles and textures. From light to very dark green these options do mimic the look of real grass quite well. For pet owners, there are multiple choices that resist absorbing pet odours if your pet chooses to use the turf as the place to go potty. The quality of artificial turf has greatly improved if you choose a high quality turf, it will withstand the Calgary winters and maintain its natural look for many years. If you are considering artificial turf you will need to consider the costs as it can be quite costly. Artificial turf requires the same compacted base as paving stones or concrete in order to resist frost heaves and maintain a level look over the years. Costs can vary depending on the style of artificial turf you choose but count on a minimum of 20.00/square foot for materials and professional installation. Chinook Landscaping can provide you with a no cost estimate for your artificial turf so contact us today to learn more. Large established spruce trees are noticeable everywhere in Calgary front and back yards. 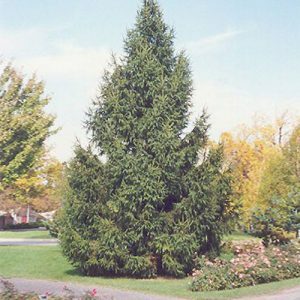 These trees are typically Colorado Blue spruce and can grow to be 30-40 feet tall and take up the majority of your yard. We are constantly asked about ways to manage spruce trees and keep them as part of the landscape. Firstly, it is never a good idea to have your lawn area compete with spruce trees. The spruce tree will always win. They are known to be very hard on lawns for several reasons. – They drop needles and shed them constantly throughout spring, summer and fall. These needles can break down and change the quality of the soil. – Spruce tree roots are very shallow and extend for a great distance to other areas of your yard. The roots draw moisture out of the soil and deprive your lawn of water and nutrients. – The large spruce tree branches shade preven sunlight and water from reaching your lawn. So, we can see that having lawn under or close to your spruce tree is probably not going to facilitate a lush healthy lawn. If you want to keep your lawn then we recommend pruning the branches up on the bottome 3-5 feet of the spruce tree. This will give your lawn more sunlight and moisture. The best option when it comes to spruce trees is to create a defined border around the perimiter of the spruce trees drip line. The drip line is the tip of the longest spruce tree branches. Create this border by using a natural spade edge, mowing pavers, Vinyl edge or raised pre cast or natural stone. This border will mean your lawn and gardens will not have to compete with the spruce tree and you won’t have to mow around the branches. The messy needles and waste can be cleaned up without trying to rake them out of the lawn. You can place fabric and 40mm rock under the spruce tree and use a blower to blow out needles and waste each season. 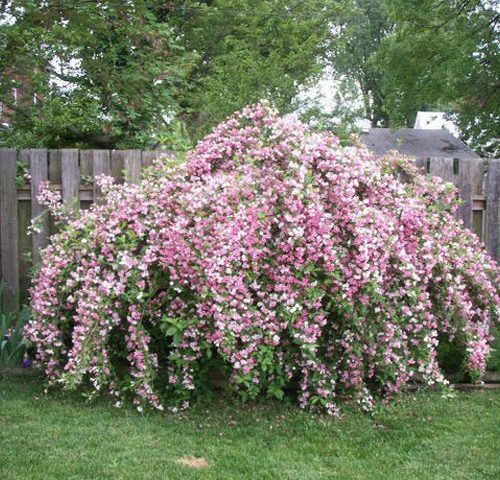 Keep in mind that over the long term, the roots may grow and lift some areas of your border. The border can be adjusted and levelled again by notching out a section of the root. Whats with all the pollen this spring? You have probably noticed pollen like you never have before this season. Yellowish mustard powder is everywhere this year in Calgary. Vehicles homes and streets are covered with pollen. Why is it so noticeable this year? In a typical season various trees and grass put out pollen at different times of the spring/summer This winter was anything but typical and winter stayed very late. So because of that all of the trees combined with the grass are putting out pollen at the same time. They don’t want to lose the opportunity to propagate. Its a survival thing. Calgary has not seen much rain this spring so that has compounded the issue. A few days of heavy rain would help to wash the pollen off trees and grass, streets, cars and homes. 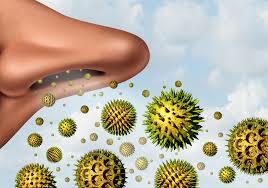 Allergies are through the roof of course because Calgarians are getting a mega dose of pollen all at once. There is not much you can do besides keeping windows and doors closed, rinse your walkways, patios and outdoor furniture. Make sure to take your allergy medicine if you have a major allergy to pollen. There are some positive aspects to all this pollen. We know if it is out there then the greenery around is continuing to thrive. Pollen is very high in nutrients so although it may be a real irritant for some, inhaling accidentally throughout the day may give you a dose of healthy nutrients!! Chinook Landscaping was proud to contribute to the St. Boniface School Playground in Lake Bonavista Calgary. There were many sponsors who helped make this project such a great success and we are proud to be one of them. We provided all the labour and materials to help construct the paving stone feature area. 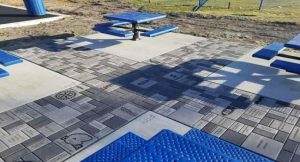 The feature area included custom engraved paving stones that were provided by sponsors including local Lake Bonavista families, individuals and various Calgary corporations. We really enjoyed being part of the project and we are proud to be part of the Lake Bonavista Community. Enjoy your playground kids! !